335mm x 480mm / 13¼ x 19 inches. 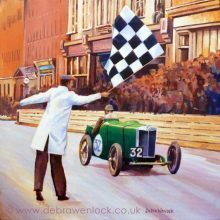 Return to Gallery Themes: Cars & Motorsport, Greetings Cards. 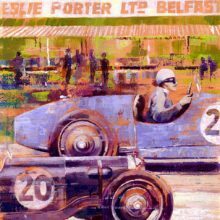 Explore: Ards TT, Lea Francis, The Art of Motoring. 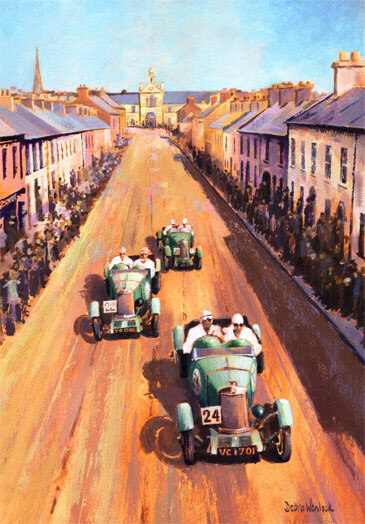 Three Lea Francis cars storm down “South Street at Speed”, through Newtownards in the 1929 Royal Automobile Club Tourist Trophy race at Ards. Ten Lea Francis cars were entered, after the win of Kaye Don (here driving car no.22) in the previous year’s race, but none of the team did well. After starting in glorious sunshine the weather broke and Carraciola, who drove his Mercedes fearlessly through the heavy rain to victory, had only Campari in an Alfa Romeo as real competition. My original acrylic painting measures 13¼ x 19 inches. 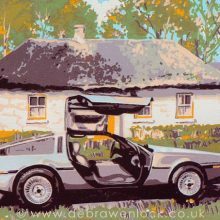 Also available as a 5 x 7 inch greetings card, for £2.50 each, from my “Love from the Artist” shop page. 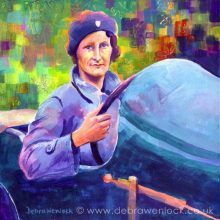 © Debra Wenlock retains all reproduction rights & copyright.